I’m doing it this way, because for some reason the ‘Right Click on Your App > Get Info > General > Open using Rosetta’ checkbox is grayed out. Oh well! P.S. Another technique is to go into Project > Edit Project Settings > Build > check ‘Build Active Architecture Only’ .. Then you can change your active Arch to PPC and the build will only include PPC and will run. Just be sure to uncheck the box before you send a build to your users. 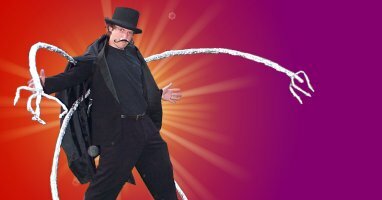 Merry Christmas – Free game from Galcon.com – Elephants! Our gift to you: A totally FREE iPhone game! I made this game several years ago with some other way-cool game-dev friends. 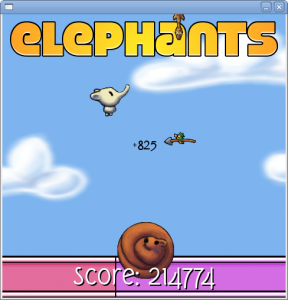 In “Elephants!” you save the giraffes while jumping on a rolled up squirrel! More fun than a barrel of pigeons! For Christmas this year I figured I’d port it over to the iPhone for you Check it out! Posted in Uncategorized | Comments Off on Merry Christmas – Free game from Galcon.com – Elephants! I found that ObjC doesn’t care much for C++ objects that do their own reference counting. To have a “Game” object at all, I had to use a pointer to my object instead of using my reference counting object. It seems that during some of the “magic” of ObjC it copies objects without calling any of the C++ copying methods, so reference counting gets killed. I ported a basic subset of pygame to tinypyC++ and made it work under openGL. I don’t have this available in my tinypyC++ repository because it takes a good deal of prep-work to use (isn’t out-of-the-box) so it wouldn’t be generally useful to anyone yet. I was able to get pause on call / resume working by saving the game state to a text file. Since tab-separated files are so easy to create and parse in python this seemed to be the easiest route to getting the project done. I learned a ton about C++ templates. I still haven’t even touched the tip of the iceberg, and I’m not sure I want to, but at least I’m getting the basics down and that seems to be enough for me to stumble through this project with. I found that STL extensions include a “hash_map” which turns out to be about 2x as fast as the normal “map”. I’m using that now. I’m not entirely sure how useful this project is going to be for anyone else, or even for me for that matter. But I think after my next game project I’ll have a much better feel for what the situation is. TinypyC++ has some real tradeoffs in terms of being a bit of a hybrid of C++ and of python. It doesn’t offer the full power of either language. But I’m doing my best to capture a middle ground between them that will make my life easier. You are currently browsing the Phil Hassey weblog archives for December, 2009.